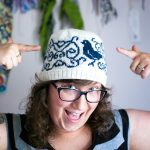 As I mentioned in my 2015 Year in Review, I was finally brave enough (or crazy enough) to submit a design idea to a knitting magazine last year. That idea became Saturday Afternoon Armwarmers and they have just been published in the latest issue of Knit Now! Designing and knitting a sample for a magazine within a month was a little hectic… As seen below, you can see how stressed I am, filling every second of my day with knitting. Saturday Afternoon Armwarmers were inspired by ‘slow moments’. I imagined sitting in my favorite arm chair, knitting a project with the softest yarn on a chilly, spring afternoon (which don’t exist here in Florida, but I tried). Oversized, snuggly arm warmers came to mind. I sketched them up, made a swatch, and the rest is history! The sample was knitted with Erika Knight’s British Blue Wool and it is lovely to knit with! Erika Knight has created beautiful, subdued hues for this yarn. The sample shown is in the Fawn and Boho colorways. I’d also recommend combos of Pretty and Milk Chocolate, Milk and Leaf, Sea Fret and Dance, Sea Fret and Mr Bhasin, and for some nice contrast, Mouse and Boho. 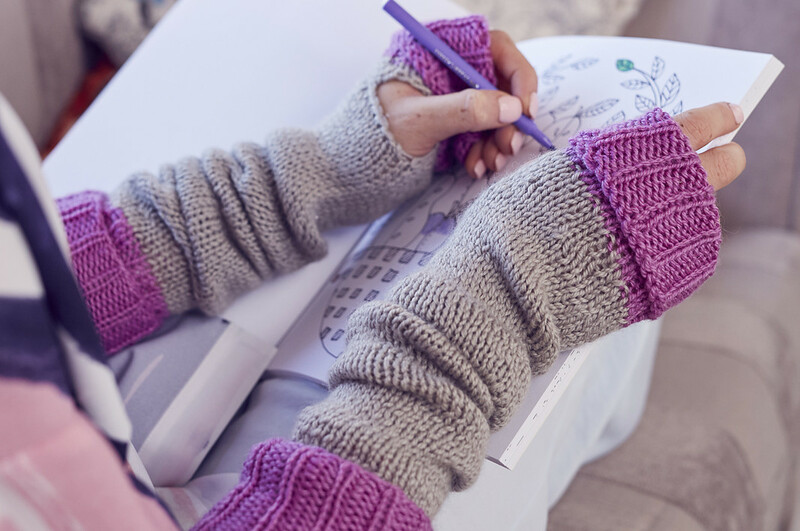 Check out Saturday Afternoon Armwarmers in issue 59 of Knit Now! If you knit some of your own, please share them with me (leave a comment or tag me on Twitter or Instagram @mandybee)! What a great milestone! Congratulations! I’m so proud of you! Previous PostPrevious Stress Less – Knit or Crochet! Next PostNext Swatch for gauge… or else!